Earlier this month I wrote how much I was looking forward to the new Verizon MiFi device. I was so looking forward to this product I showed up at the Verizon store the day it was released. This credit card size device allows me to be my very own personal Wi-Fi “Hotspot”. Using my laptop when I travel the MiFi replaces my old Verizon USB modem and provides the same bandwidth. As a bonus, the MiFi allows up to 5 connections so my wife and/or grandkids can also use their laptops if we’re stuck in an airport. One of the main reasons I really wanted the MiFi was to use with my Apple iTouch. I didn’t want an iPhone (which has less memory) to use as my cell, but I did want something to connect me to Twitter, Facebook and other online services. The iTouch supports Wi-Fi so I only had connectivity when I was near a hotspot. Now, I AM a Wi-Fi hotspot where ever I go. The same week the MiFi was announced, Slingbox announced Apple had finally approved their iPhone application but with one condition. It wouldn’t allow streaming over the AT&T network but it could use Wi-Fi as a connection. Slingbox is a device connected to my TV/TiVo and the Internet which allows me to watch my TV while I’m out of the house. I figured using the Slingbox software was a great way to test the speed of the MiFi. The result is a B+. 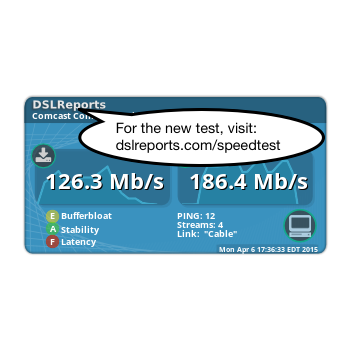 I use DSLReports.com to do my speed tests and was happy with my first speed test using my laptop and MiFi. So far the only problem I had was obtaining my new MiFi. Verizon announced they would be available on Sunday, May 17th. When I called my local Verizon store they said, they had plenty and I could come pick one up. I wasn’t happy at all when I arrived to find out, I could only order one which wouldn't arrived until Wednesday. I later found out each store was supplied two units and that they were only to be given to new customers. Verizon that’s a big FAIL. I’ve been using mine for 10 days now and I love it. Riding in the car, waiting to see my doctor, sitting around the pool, looking up something(showing off) at a friends house it’s a great toy. The battery life spec says four hours and so far it has lived up to its claim. The battery died on my iTouch before the MiFi lost power. For more specifications on the MiFi, click here. Memorial Day is always an emotional weekend for my family and others. Last year I discovered a nationwide programs called the Honor Flight Network. The goal of this charity is to help send World War II veterans to Washington D.C to visit the five year old WWII National Memorial. The Honor Flight Network won’t be around for long because our World War II veterans are passing away at a rate of 1,200 a day. Last year, I started what I hope will become a WinPatrol tradition. I took all our $29.95 Memorial Day upgrades to WinPatrol PLUS along with my own cash and donated everything to our local Honor Flight Network chapter. Last year I raised $1,078 to help send World War II vets to Washington. I regret my dad who served on Siapan never had a chance to participate before he passed last month. Hopefully this year if I can get the word spread via Facebook or Twitter. we can beat last years total. So, if you’ve been thinking about upgrading, May 25th, 2009 might be a good day. Click here to purchase your WinPatrol PLUS activation code. So far most of my predictions about Windows 7 have been right on the money. Microsoft has scaled back the number of versions. Computer manufactures confirm they’ll have Windows7 installed on machines in time for Christmas. Unfortunately, the one thing I may have been wrong about was the price. I expected the price of Windows to come down but I was too optimistic. The best thing going for any “I’m a PC” campaign is price yet Microsoft seems to think if Apple can gouge customers they can too. Did anyone tell Microsoft we’re in an economic crisis? Brisk PC sales could really help the economy but if the cost of the OS is over 25% of the total PC price we’re in trouble. Worse yet, the high cost of Windows could impact the single most requested add-on to any purchase which is Microsoft Office. So far Microsoft hasn’t officially announced pricing. You may have seen reports of leaks by folks at Dell Computer but they’re not the only one I’ve talked to who is concerned. Sources outside the U.S. have also reported that Windows 7 will require a larger investment than Vista. Reports say prices may range from $199 to $319 USD. 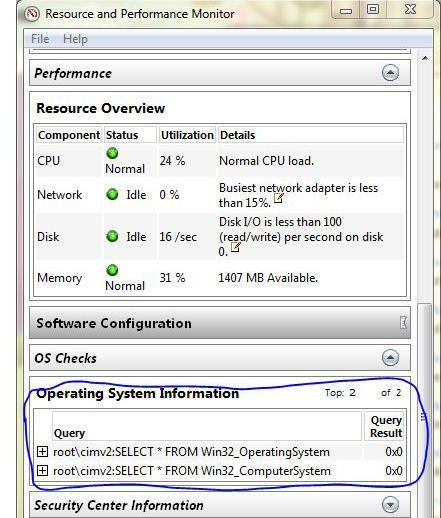 OEM’s I’ve talked to say Windows 7 Home Premium will be their default package. There is some good news. Most new machines won’t require any upgrades to run Windows 7. The Windows 7 compatibility program is likely to be more successful. That means there will be less expense upgrading to new hardware and software. According to a survey by Windows 7 News 46% of their readers say their choice will be Windows Ultimate. 25% want Windows Home Premium and 16% say Windows 7 Professional. Hopefully, the high price leaks were done on purpose to lessen the blow when introductory prices are officially announced. There’s the optimist in me coming out again! Social Media Marketing is Great on One Condition. Have you heard enough about using Social Media to showcase your business? Well, it’s true that using Social sites like Facebook, Twitter and Blogging can help your business but there’s one caveat. You better be damn good. You better plan on treating your customers right. If you’re not prepared to play by the rules you’ll find your business blacklisted and your marketing efforts will do more harm than good. We’ve all heard of customers being treated poorly by companies and consumers are fed up. Years ago, America Online suffered major embarrassment when someone trying to cancel their account recorded the conversation and later posted it on YouTube. If that same event happen today, it would have taken a tenth of the time to generate ten times the audience. The popularity and real-time content generation of Twitter may help get your good news out quickly but if you have bad news it will make your head spin. Recently, I found that one of my newest WinPatrol users had a dispute with Symantec via one of their phone support representatives. In the process WinPatrol was maligned and the user was billed $99 USD. See “Symantec Support says WinPatrol is a virus”. In an effort to blow off some stream my first reaction was to Twitter my story. Within an hour my message was Re-tweeted by others including a couple above who directed their RT toward a Symantec rep they knew via Twitter. The next time I signed on Twitter I had two new followers who worked for Symantec. In less than 24 hours I was contacted by Noah from Symantec PR for more information and an offer to help. I asked for no apology and none was given but by the end of the week a credit was provided for $99 to our mutual customer. I’m happy to acknowledge Symantec listened and did what they had to do to make things right. I’m still not a big fan of Symantec software or support but I give their PR folks five stars. It’s obvious they recognize how important it is for their people to monitor social networks and prevent any bad news from spreading. So, if you’re looking at using Social Media to help your image, you better be ready to back it up. Will P. R. pros take the baton of investigative journalism? I have plenty of friends who have been talking about seeing the new Star Trek movie but only a few have been paying attention to the real space adventure. Since launching on May 11th, the Space Shuttle Atlantis and their crew has been busy on the the final mission to service the Hubble Space Telescope. If you think Star Trek is great, you haven’t seen anything yet. You can watch the scenes from a real space adventure at http://hubblesite.org/servicing_mission_4/. There’s no denying we live in a global society and those of us who speak English aren’t alone. Most content on the Internet is in English but that’s slowly changing. Currently 18% of new downloads of WinPatrol are of the non-English version. I respect that people want text in their native language and have tried my best to support my friends in other countries. My job just got easier thanks to the Microsoft® Translator Widget. Currently only available by invitation, the Translator Widget provides an easy, quick translation into 13 new langauges. It’s like magic. Granted, no translation technology is perfect but I hope my readers and WinPatrol fans will appreciate the effort. 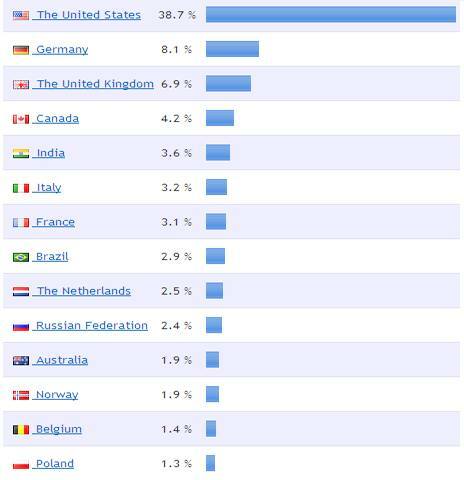 The WinPatrol.com stats below for the last two week show how much support I’ve had from friends outside the USA. This is a clear indication that Microsoft has helped provide a solution for a large part of my user base. Currently the following languages are available with more to come. The Microsoft® Translator web page widget is currently a “Technology Preview” so I’m honored to be chosen as a participant. I look forward to improvements in the technology and seeing this widget on other popular web sites. Over the years I’ve had the pleasure to meet many other professionals who spend their time helping consumers protect their computers. Most of the time, my new friends work for companies which might be considered competitors. In consumer security there isn’t the same competition as other industry's. There’s mostly cooperation and friendship with others who came into the profession because of a sincere interest in helping. Some of the bigger companies don’t have the same philosophy and have been known to pick on the little guys like me. 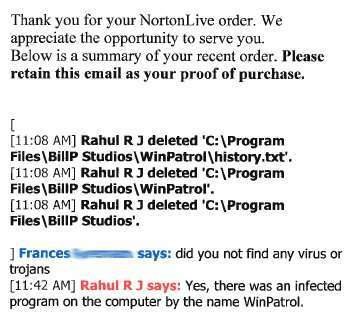 In October 2006, WinPatrol users were letting me know that Symantec was telling them they had to remove WinPatrol to install Norton Internet Security. It turns out if you read the screen, it was only a recommendation but it was confusing and rude. I wasn’t the only victim, they recommended folks remove SpyBot Search & Destroy and others. Click here for previous article. This week I was surprised to hear that a Symantec support rep actually told a customer that WinPatrol was a virus and during a remote assistance phone call they deleted WinPatrol from their system. It appears WinPatrol had detected and removed a questionable file for the user and logged the action in our history file. Apparently, the mere mention of the filename in our history text file was enough for the Symantec rep to wipe out anything associated with WinPatrol. This wasn’t a false-positive caused by a new signature file. It was quick attempt by a support rep to dip into the pocket of an uneducated customer. For their assistance Symantec charges its victim $99. Apparently Symantec is having tough economic times. They’ve even dishonored themselves by partnering with Ask.com to generate additional revenue at the expense of their customers. Needless to say, this is unacceptable. The customer deserves a refund and an apology. I welcome appropriate action by anyone at Symantec interested in doing the right thing. Security Garden: Symantec What are you doing? I’ve always been a big fan of mothers. My own mother passed over 10 years ago but naturally, I still think about her on Mother’s Day. 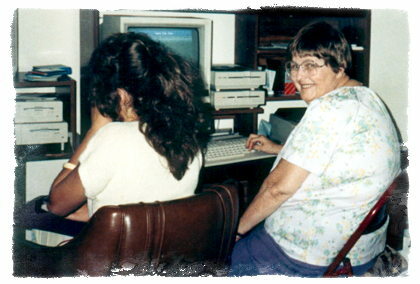 My mom was actually an early computer user starting off with a Commodore 64 and C= 128. Her last computer was from Gateway 2000. She was always proud to show off any program I created including the cute little Scotty dog that helped keep her computer safe. Yes, that's my mom checking her Email on Q-Link. In honor of Mother’s Day 2009 I’ve created a coupon that provides $10 off an upgrade to WinPatrol PLUS. So if you’d like to protect your mom this is a good time to introduce her to Scotty the Windows Watchdog. It’s a quick and easy upgrade to WinPatrol PLUS at http://bit.ly/wplus. How would you like a WiFi connection anywhere you go? Last December I put together a list of predictions for 2009. One of the things I wrote about was the increase in using 3G type cell networks instead of WiFi Networks when traveling. I have discovered when I travel Wi-Fi coverage can be spotty. Hotels boast high speed Wi-Fi connections but they aren’t doing a very good job. Even at a recent Microsoft conference I ended up using my Verizon EV-DO connection because it was faster than the Wi-Fi provided. Currently the best reason to use 3G over WiFi is security. Keep your WiFi networking at home and use 3G when you travel. After traveling again earlier this year, I’m even more convinced you can’t depend on public hotspots and found my Verizon USB modem more dependable. It could be I always request rooms in quiet locations away from the elevator but the WiFi has consistently been poor. Today Verizon announced my next new toy. The MiFi 2200 Intelligent Mobile Hotspot will be available on May 17th and will be in my hands soon after. A creation of Novatel, the MiFi 2200 is a portable WiFi HotSpot that weighs only 2.05 ounces and will fit in your shirt pocket. 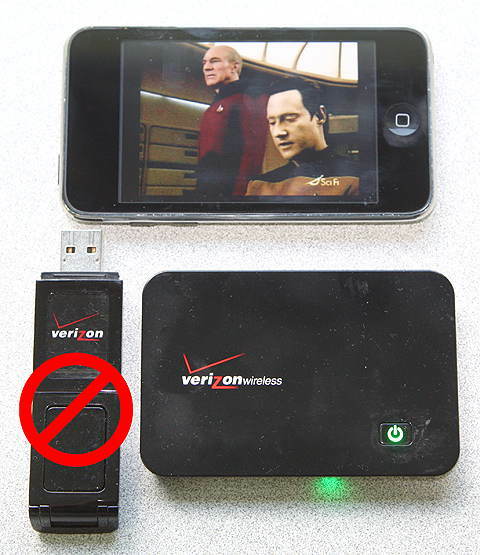 It uses the Verizon 3G broadband mobile network. According to the published specs, the MiFi has a battery life of 4 hours and includes a USB connection which will provide additional power on the road. Up to 5 WiFi devices can use the MiFi for an internet connection. I first learned about the MiFi from David Pogue who wrote more about the MiFi for the NY Times. He says a 1 hour TV show on iTunes is 200 megabytes which calculates to 25 shows a month if you’re on the 5 GB plan. I agree 5 GB a month is plenty of bandwidth for me. So why am I so excited? I already pay $60 a month for a USB modem that only works on a single laptop. As I’ve mentioned before, I’m happier when I use Verizon 3G network when traveling. Recently, I shocked fellow travelers at Dulles Airport when I connected to my home Slingbox and watched a show I had previously recorded on my TiVo. The video quality was great which you might not expect for a cell network. If I’m traveling with others, theyll be able to use my MiFi hotspot at no extra charge. I love using my Apple iTouch. Unfortunately, once I leave my home WiFi network I can’t connect to many online services like Facebook or Twitter. Now with MiFi in my pocket my iTouch will have all the benefits I would want in an iPhone but I can keep the 32 GB of memory available in the iTouch. Verizon also claims that MiFi will be for cameras. I do have an EyeFi SD card in my camera but I’m not counting on a connection right out of the box. Once I get my own MiFi, I’ll let you know how it really works. This week Microsoft is distributing the “Release Candidate” of Windows version 7. I’m sure you’ll be reading about it all over the place. Blogs like Ed Bott Windows Expertise and Paul Thurotts Supersite provide information on all the new features complete with screen shots and setup advice. Naturally, I like to focus on the unusual and this week I picked out some of my favorite and not-so favorite features. 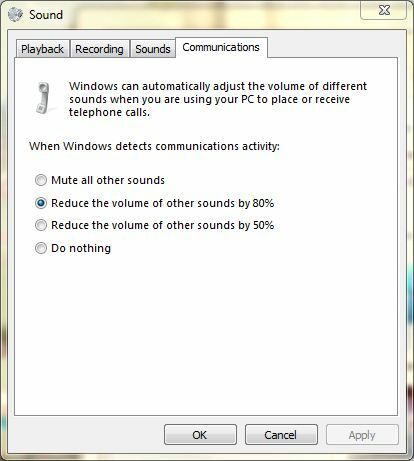 There is plenty of good new stuff in Windows 7. New desktop backgrounds, screen savers and animation effects really make Windows 7 a graphical experience. I tend to look for the not to obvious new features. Here’s one that really makes sense. Another feature that looks really nice is the System Health Report. This can be found in the Control Panel on Advanced Tools for System Performance. I was hoping for some user friendly information but what you get looks like some kind of SQL statement which makes absolutely no sense to me. Here’s some more unfriendly, useless system performance information. The red flag is warning me I don’t have any approved AntiVirus product installed. Everything else is about as useful as a message that says “Error #5”. One of the things that make me the happiest is when features are located in the same place as previous versions. When I need to help someone fix a problem it’s so much easier to have a single set of instructions. I prefer this to having waste an Email asking which version of Windows is being used before I know how to provide detailed steps on how to get to the desired feature. So I was pleased that under Internet Options, the button to delete saved content to clean up the cache was basically in the same location. I was even happier to see that Microsoft has expanded the types of information you may want to delete. 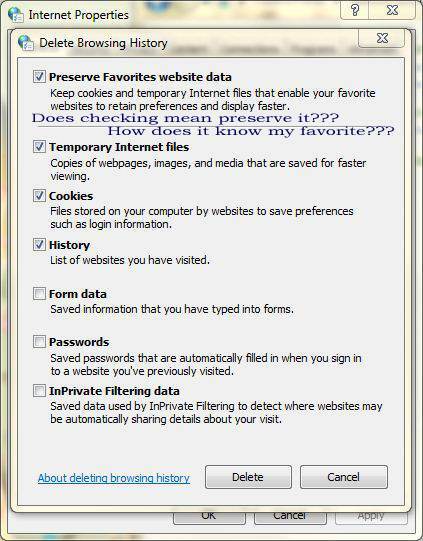 The only problem is you might be confused by the wording in the following dialog. Does the check mean it will be deleted or it will be preserved? Now for one last final nitpick even though it’s not really new in Windows 7. Why do they still call it a Recycle-Bin? If you move files there are they reused to save a tree somewhere? It’s nice to be politically correct but we really need to go back to calling this a Garbage Can or even better a File Shredder. I’ve only had the new Windows 7 for a week so there’s a lot more I haven’t explored yet. Stay turned for more Good, Bad and Ugly. Do you always know for sure where you’re entering your name and password? This week many of my friends on Facebook reported getting stung by yet another hacker trick to get someones name and password. Many received an Email with a message about something new on Facebook and received a link which appeared as it if was Facebook. Surprise, surprise it turned out to be a completely different website that just looked like the Facebook login page. Simple tricks like this remain the most common distribution methods of deceptive programs and ID theft on the Internet. Once someone has your name and password, they have access to your valuable contact list. Your unsuspecting friends will start to recieve similar invitations and even downloadable files with every possible kind of malware. Many of your contacts will trust an attachment because they think it comes from somone they know. While this is a typical phishing senario, there are many other ways to give away your name and password. Many social networking sites will want you to give them your Email and password so they can collect information on your contacts and provide you with a better experience. While I’m sure some of them are legitimate and trustworthy I say Don’t Do It. I have no reason to believe my example below from Facebook is devious but I still think it’s a bad idea. This is typical of many social networking sites including LinkedIn and Twitter. Some are more aggressive and trickier than others. Twitter has a lot of new 3rd party tools popping up so it has been the target of many new scams to obtain name and passwords. Don’t just try a 3rd party tool for Twitter just based on Tweets from your friends. It’s always possible the people doing the recommendation have had their accounts compromised. While I’m on the subject, let’s talk about your password. Do you use the same password at multiple locations? Come on, I know you do and it’s another really bad idea. Even if you don’t fall for one of the tricks I’ve mentioned your name and password could be compromised by some other method. The first thing a hacker will do is try the same password to access PayPal, eBay, gmail, hotmail, AOL, banks, credit card sites, Facebook, Twitter etc… Not only could you lose money, anything they say or post online using your name will exist forever. Yes, it can happen to everyone. Check out what Steve Bass had to say in his TechBite newsletter. Password Disaster: My PayPal Account was Hacked.